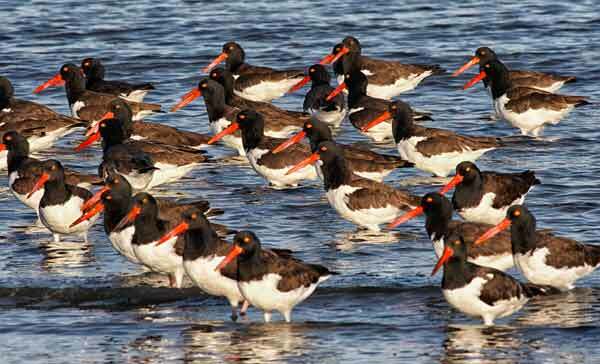 These American Oystercatchers, haematopus pulliatis, are resting on the south end of Brigantine Island, New Jersey, in the fall, when they often gather in large groups. One of the largest shorebirds, a breeding species in New Jersey, oystercatchers specialize in feeding on bivalve mollusks living in saltwater. The Eastern race breeds from Massachusetts south to Mexico. The Pacific coast race breeds from the Baja peninsula south.